The German band Rough Silk is now celebrating their 20th anniversary, even if there have been times when they haven't been very active. 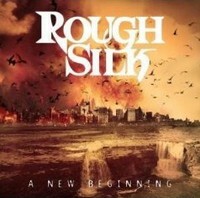 Anyway, mainman Ferdy Doernberg is keeping Rough Silk alive and is presenting a new album called A New Beginning. The album kicks off with Temple Of Evil, first some Oriental sounds, then heavy riffing accompanied by keyboards, but the keys aren't bombastic or symphonic.... More in the tradition of the 70's rock. Keyboarder Ferdy Doernberg is now also handling the vocals and plays guitar, too. The opener is a melodic heavy rocker with a catchy refrain and some slower passages where Ferdy is showing his skills. He shares the guitar duty with Mike Mandel, both play lead and rhythm guitar, so I can't tell who is responsible for the lead parts here. Due to Ferdy's vocals are slightly raspy and together with the heavy riffing they dominate Home Is Where The Pain Is. This tune has a 70's touch due to the keyboard, but it also carries a boogie vibe - just it's way heavier then the 70's stuff. The songs are heavy melodic metal tracks, but the vocals add aggression... Make it sound heavier... Even a bit mean... Check out Reborn To Wait! During the refrain the lead vocals remind me a bit of Alice Cooper, but he also adds some growls... And spoken word parts. With Roll Ot The Dice Rough Silk present a song which is fascinating in a way, they combine different elements - but its the use of vocals which vary from melodic parts to growls to scolding parts.. At some parts it seems they lost their way... derailed, but then they find back together. Another surprise is the trumpet at the end of the song. I'm not sure what to think about this track. The opening of Sierra Madre minds me of Jon Bon Jovi's Blaze Of Glory, but then the song becomes more a kind of movie soundtrack... But then it becomes a heavy rock with a catchy choir. And even a thrashy edge when they speed up. At the title track A New Beginning they sound extremely heavy... and doomy. And then the sound changes completely and the song becomes a heavy progressive tune with a catchy hook. With Black Leather you get a Running Wild-esque tune and the following We've Got A File On You is a punk rocker... But with SoCal elements. Or Beastie Boys influenced? And they change to a slow semi-acoustic part, just to head back to the punky style. The opening riffs of Deadline are surely Judas Priest-adapted, but then they head more into the Accept-kinda style... I don't get it. Rough Silk always had great melodies and catchy hooks, they are heavier now... But they add other elements and somehow I miss the homogeneity... Some parts remind me of Chris Caffery's Faces, but while Faces hooked me up right away, A New Beginning leaves me puzzled... I'm not sure what to think about the album... Perhaps it need even more time to grow.... No sonic fast food - that's for sure. This time I can just recommend to check out several songs and to make up your mind. 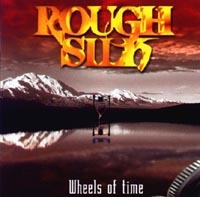 After 10 years of Rough Silk the time was right for a review and so Ferdy sat down with the current line-up and now you can listen to Wheels Of Time! This presents every line-up and tracks from every release, some are re-recorded, some are remixed and there are 4 new tracks. If you already have all Rough Silk releases it's still interesting, coz there are different versions and new tracks. For the fans who want to check the band out, it's a great collection! In the past the band had the chance to play live with some of the finest metal acts. This is more than just a collection of songs, this is the life-work of Rough Silk so far! With more than 140 minutes of music, this is value for money! It's a pleasure to listen to and to take a look at the photos and to read Ferdy's words. Enjoy it!